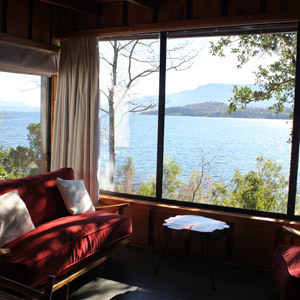 Back when much of Patagonia was a lawless no-man’s land and tourists were about as common in the Atacama as thunderstorms, Hotel Antumalal, a countryside retreat at the northern end of Chile’s lake district, was already humming with guests. Time has been kind to the Antumalal. 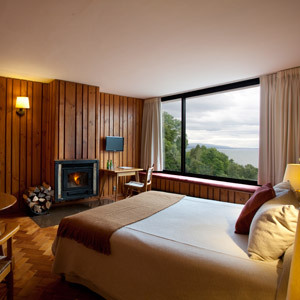 The 1950 Bauhaus-inspired hotel, with its glass walls and its terraced gardens overlooking Lago Villarrica, looks as relevant — and, more to the point, as inviting — as ever. 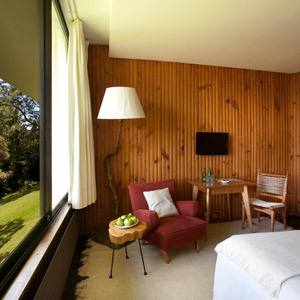 The original family of owners has continually modernized and painstakingly maintained the hotel. 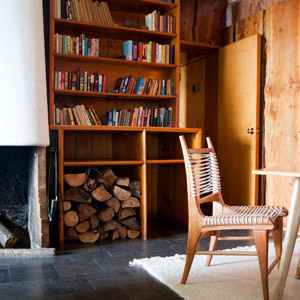 In addition to original wood-burning fireplaces in each of the rooms and the knotty wood-paneled walls, there are new additions like plasma TVs and sound-proof doors and walk-in closets that 1950s guests probably never dreamed of. Like the plentiful views of the outdoors, thoughtful touches such as fresh flowers from the garden and daily homemade chocolates remain as welcome as ever. The spa, carved into the rock of the hillside on which the hotel sits, is perhaps the most remarkable new addition. 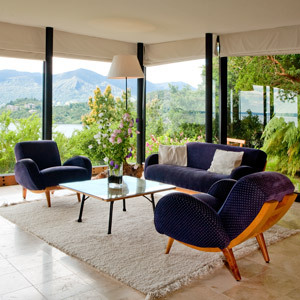 The original pool has been divided in two by a glass wall — the indoor side with its roaring fireplace being the more inviting in the southern hemisphere winter, the outdoor’s terrace-lawn overlooking the lake made for summer. The hydro-massage pool, and especially the sauna with still more panoramic views of the lake, offer relaxation any time of year. The area around the nearby town of Pucón is a favorite of outdoor enthusiasts, and for good reason — but for all its natural splendor, Villarrica somehow remains relatively quiet. In addition to the lakefront, the hotel’s own twelve-acre grounds contain waterfalls and natural volcanic rock pools reached by pebble paths lined with flowerbeds — not a bad warm-up for what lies beyond. Nearby, there are still more waterfalls and lakes, these ones on a larger scale, in nearby Huerquehue National Park, plus all the bird-watching, fly-fishing, river-rafting, volcano-climbing, mountain-biking, horseback-riding and hot-springing you could ever want. Plenty to justify a day at the spa, or a second helping at Antumalal’s old-fashioned, laid-back Sunday asado. 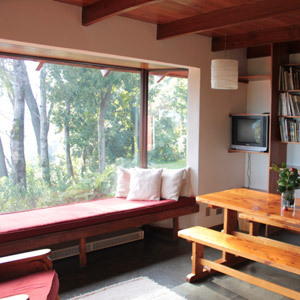 Chalet with private parking and panoramic lake views. Independent Chalet on edge of Lake. Arrival is via steps.